Labour’s current average for February is 33.6%: up 0.6 points on January, but still below the 35.6% the party scored in September. The Tories are unchanged on 32.1%. Six months ago their average was 31.8%. 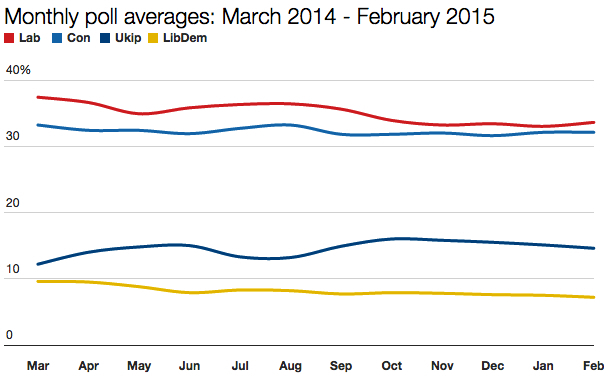 Ukip is on 14.6%: 0.5 points lower than January. The Liberal Democrats are on 7.2%: yet another record low for this parliament. At this rate the party will be below 7% by April. After a period of movement for both Labour and Ukip in the middle of 2014, both parties have somewhat settled down of late. 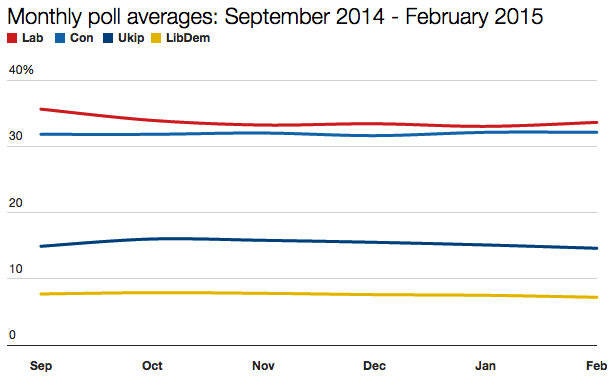 Since October, Ukip’s average has been in a gentle decline, while Labour has been bumping around between 33 and 34%. The Tories have remained stuck below 33% save for August, when they hit the dizzying height of 33.2%. The Lib Dems just keep on sinking. Two years ago in February 2013, Labour was on 41.5%, almost 10 whole points clear of the Tories, while the Lib Dems were on 10.3%: 0.5 points above Ukip. As ever, I’d caution against extrapolating anything precise about the election result from these figures. The polls tell their own story, and it’s always an interesting one, but it’s not one that foretells what will happen on 7 May. I’m wondering, is Labour’s noticeable dip in September related to Scottish voters flocking to the SNP during the referendum? Similarly UKIP seems to have peaked at the European elections, and again around the time Douglas Carswell became their first MP.